DEDHAM, MASS. 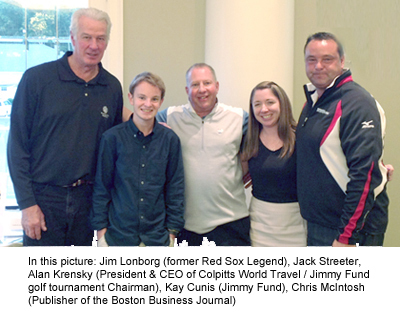 – In keeping with the tradition of giving back, Colpitts World Travel on Monday, Sept. 23, hosted its 24th Annual Jimmy Fund Golf Tournament at Charter Oak Country Club in Hudson. The global travel company organized the event, which raised in excess of $50,000 for the Jimmy Fund. All proceeds support groundbreaking cancer research and patient care at the Dana-Farber Cancer Institute in Boston.